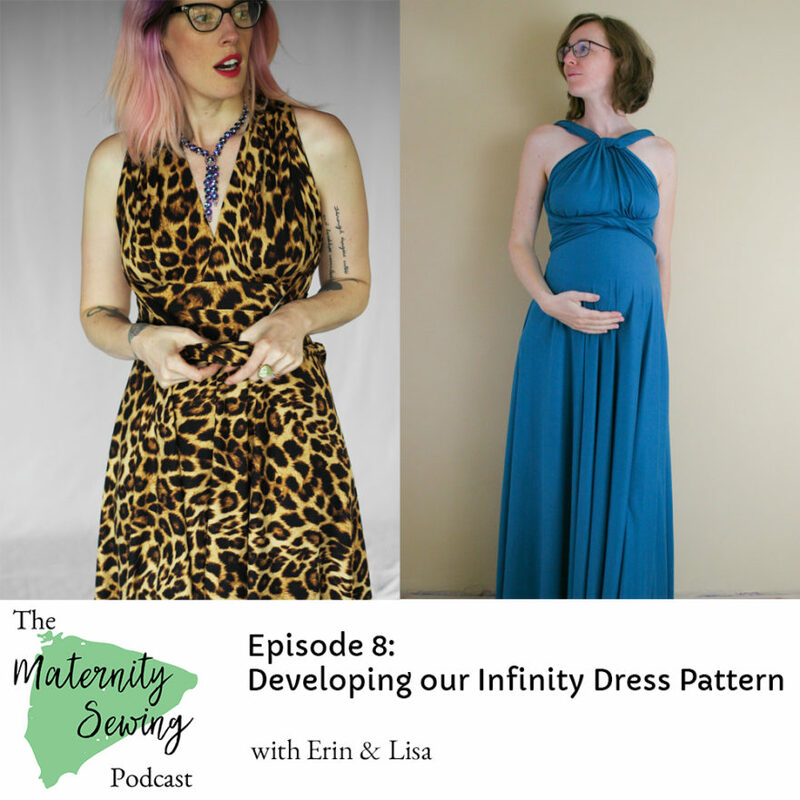 Erin and Lisa talk about their new Maternity Sewing exclusive Knit Infinity Dress pattern (launching next week, December 4th! ), what it was like to work together to develop a pattern, and why they think their new pattern is awesome. 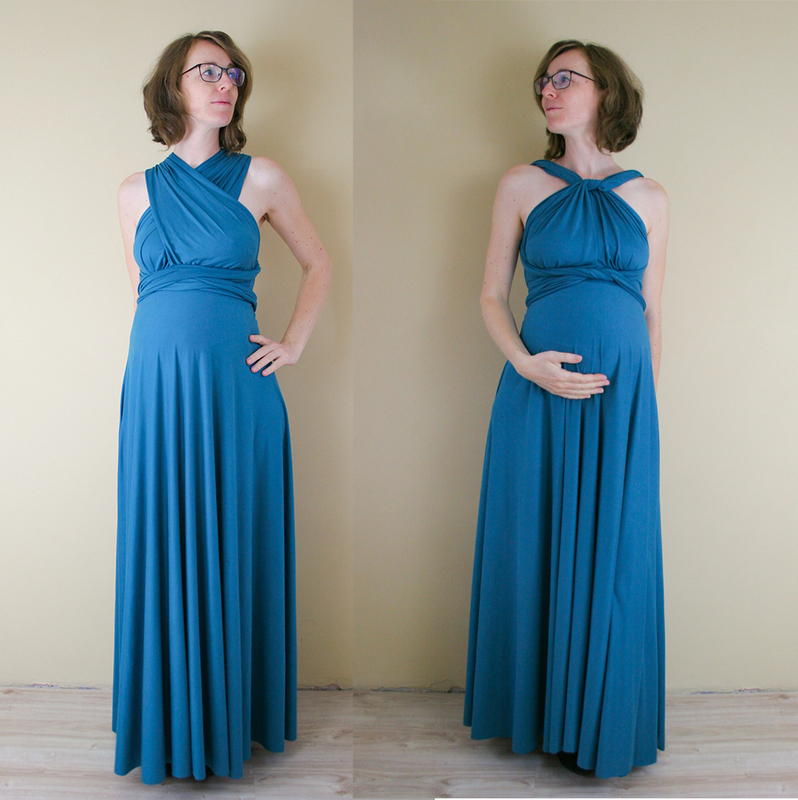 Keep an eye on our blog for the Infinity Dress pattern release (coming December 4th)! We’ll have photos of more dresses on our amazing testers (with different body shapes and sizes) and a complete step-by-step photo sewalong coming too! We’ll update the show notes here with links as the pattern is published! [0:28] Postpartum life and body positivity. I’m Lisa Kievits. And I’m Erin Weisbart and we’re the owners of maternity sewing.com. Today we’re going to talk about our Infinity dress pattern which is our brand new maternity sewing exclusive pattern that’s launching next week, December 4th, and Lisa and I are going to chat a bit about making the dress pattern, what it’s like to work together, and why we think our pattern is a really great version of an Infinity dress. 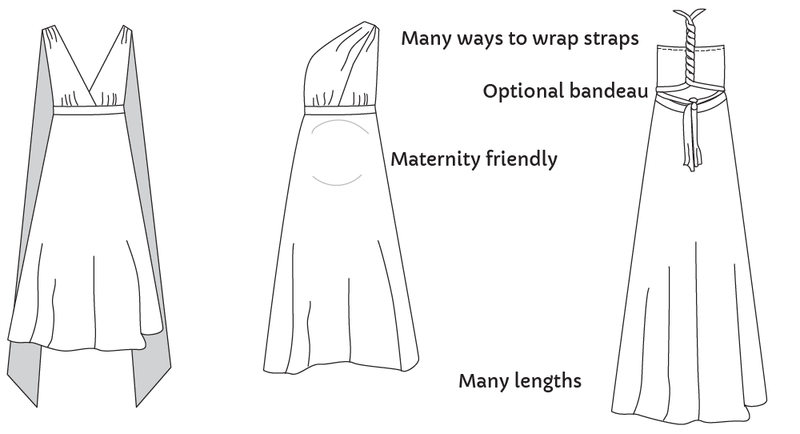 Just one of the reasons we think it’s awesome is because the same dress works for both pregnant and not pregnant bodies so you can wear it through pregnancy and postpartum or neither of the above. [1:18] Hey Erin. Hey Lisa. How’s it going? Good how are you? Good. [1:25] So today we are going to chat about our brand new Infinity dress pattern that is launching next week for people that are listening to this episode the day it airs. If you’re listening to it a little bit later, the pattern’s here. you know every pattern designer maybe goes through the same process kind of but it was really very nice to see how the other person organize it because usually you’re just on your own working on patterns and then you figure things out as you go along and. [2:30] You don’t know much about how other pattern designers work and how they do things. So that was really fun to see how how you do things and what programs you use and everything like that. [2:44] Yeah it was definitely fun to have I mean just somebody else to be able to just working with anybody rather than being alone in your basement with your cats helping you is about the extent of the help I usually have. So it’s pretty fun to to actually you know step by step just even be like “hey I think the back waistband to turning out a little wonky on me. What do you think?” Yeah exactly. I really noticed that we it seems like because we were two two brains of two brains use for this pattern that we had a lot more good ideas as well for the patterns and it was easier to make decisions as well I think. To you know to decide what kind of design features you want and how to do things and everything. [3:32] So I think it really benefits the pattern to have two people people working on it. Most definitely I think especially in terms of decision-making cuz it’s I mean I think I end up second-guessing myself a lot. Not that I don’t think I make good decisions but you know it’s the patterns aren’t just for me. So when I’m working on my own it’s “well, this is how I like it, but are other people going to like this more?” And you know “Is this maybe a better alternative?” Or you know “A tester said they liked this but I disagree but should I do with what testers like?” And having the two of us it’s it makes it just so much easier to be like “Hey. This is what I was thinking.” and then you know and then you can go like “Yeah I definitely agree with that.” Alright done. Like we don’t have to worry about anything else. Or like “Yeah I think the other thing.” I’m like “okay I see your point. Done.” There’s a whole bunch of skipping steps to the “done” part. It goes a lot faster and I think it was kind of a crazy idea to begin with. Because we only started. Usually it takes me like 3 months to finish the pattern, at least, I think. We did this more like less than half the time I think. It’s really goes so much faster with two people. Yeah so that’s pretty cool to to notice. It makes me really excited for our other patterns that we’re going to release together. [6:29] you know the feedback we get from testers. I made so many little changes that help us get just a really great end product. And it’s always kind of fascinating, even with the two of our brains going through, it still had you know over a page of single spaced feedback of tiny little changes to make. None of which were necessary. The testers were all able to make their dresses just fine. But you know all these tiny little things to say like “hey it would be even better if you made this one change” and all of those together I think. [7:06] I am super proud of what we’ve got and I’m really excited for people to be able to sew it and wear it. Me too. 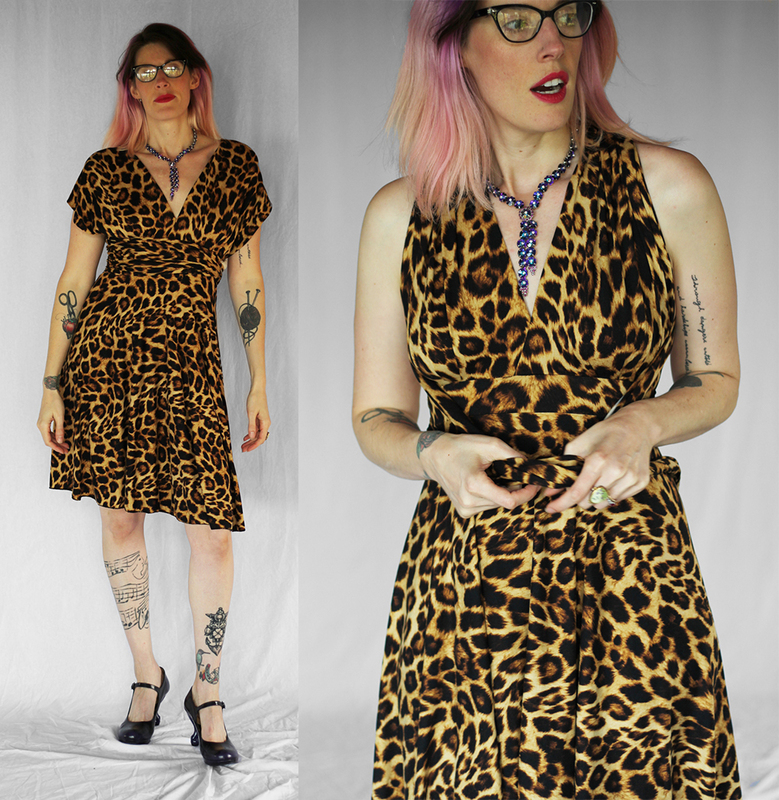 Also really with testers it’s always so great to see the dress on other people’s bodies to see it on different body types and the different fabric choices that people make and makes me even more enthusiastic about this dress. I was like whoah this is really a cool pattern that we’re making. I mean you can always like you see it on yourself and tell what’s going to look like and everything. It was cool to see to see it on other people as well and just made me even more. and you can come up with cool spaghetti straps and zig zags and twists and just all sorts of ways that you can wear the single dress so you get really different looks. And that is another really cool thing about seeing it on testers is you know seeing different bodies and preferences and what people have done to make the dress feel like theirs and fit their style. Like same dress, but it looks totally different on different bodies with different ways of wrapping the dress. Yeah exactly and you can really choose if you have different kinds of events to go to, you can if you go to a dinner party you can wrap the option with the with the short sleeves for instance or if you have like a New Year’s Eve party you can you can wrap it in such a way that it shows more skin and so that’s that a really cool thing about this dress. [9:38] What also makes it perfect for us as a first pattern I think is that it’s suitable for for pregnant women because it really covers your belly well and it just it doesn’t need any. [9:52] Adjustments for that. But It works just as well if you’re not pregnant or if you’ve never been pregnant or whatever stage you’re in really. And that’s you know it fits so well with maternity sewing and what we’re trying to do what we’re trying to do and what our messages that it’s just it’s perfect for all all stages and without with so little adjustments ready and so I think it’s really the perfect pattern for us. [10:23] Yeah definitely. You know as we have developed it you and I have very similar bodies in terms of size and shape but you are almost 9 months pregnant right now and I’m not pregnant at all. But both of you know both of us loving the this dress and our testers represented that whole range as well, including you know one tester love the dress for herself and then her mom wanted to steal it so you know again, this is not a maternity dress, this is flattering of all sorts of shapes and sizes and stages and ages and and that is what we want to be all about. Yeah, and I also really loved how it made me feel because I I mean as you say I am 37 weeks at the moment and. [11:22] You know you try with maternity clothing to you know to dress yourself in a way that still represents you, even when you’re have a big belly and you’re almost at the end. But this dress when I put it on it was just really made me feel very pretty really. I was really pleasantly surprised by that. Like it made me I immediately regret it that I didn’t really have anywhere to go with it because it’s just I was like “wow this looks really good on me and it doesn’t matter that I have a big belly”. This yeah it just really emphasizes my belly in a really good way and I was really pleasantly surprised by by how it made me feel so I really hope that. [12:07] Other people will feel the same about this dress. Yeah and I think from the flipside, both me personally and testers commenting exactly you know like “hey we have we have Mom tums, or whatever phrase you want to use. I do not have a flat belly anymore since I have had a kid and you don’t notice that and this dress. And so both you know it’s kind of cool both that it’s emphasizing a pregnant belly you know on a pregnant belly in a really elegant comfortable way but it also is not emphasizing to a non pregnant belly. You know there is no you don’t notice that I’ve got squish in places that I am still getting used to having squish. And so just a right before we wrap up, I wanted to point out like a couple things that I think make our pattern even more cool and thoughtful than other variations of infinity dress patterns out there. So our we have a waistband in ours which is really nice for giving some definition I like having a little bit of a waist definition I think helps. [14:35] If you want to choose like we also have the bandau top underneath.So if you want to go from make it for maternity now but don’t want to wear it as maternity later, then for the whole dress you don’t have to change anything the dress just goes with you. You would only need to make a different like a different bandeau top without the maternity gathering it has on the side. [15:05] I can’t think of a way that this dress could be more versatile really. Yeah I think we’ve got something cool and we really hope that you guys liked it too! You can check it out on maternity sewing.com/Infinity-dress or you can see in our show notes we will have a bunch more information and links which is maternity sewing.com podcast. [15:31] That’s it for today’s episode of the maternity sewing podcast. You can find maternity sewing at maternity sewing.com. You’ll find our curated pattern shop with maternity, nursing, and postpartum friendly sewing patterns, our blog where we have sewing tutorials and inspiration for pregnant, nursing, and postpartum sewists, and the show notes from all our podcasts. I’m Erin Weisbart, your co-host today and co-owner of maternity sewing. You can find me at Tuesday stitches.com and on Instagram as Tuesdaystitches. I’m Lisa Kievits, your host today and co-owner of maternity sewing. You can find me on paprikapatterns.com and on Instagram as at paprika patterns. we have some ideas kicking around about what patterns were going to develop next together but we’d certainly love to hear from you.